How do I know if the BC trans fat regulation applies to my business? What are the BC trans fat regulatory requirements? What food does the regulatory requirement apply to? Why does the regulation restrict trans fat to 2% and 5% or less trans fat of total fat? 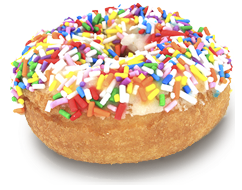 How is the BC trans fat regulation enforced? How is the BC trans fat regulation enforced in chain food service establishments? What documentation do I need to keep on site and provide to the Environmental Health Officer/Health Inspector to prove my foods meet the restrictions? What about naturally occurring trans fat or “mixed food items”? If I manufacture or distribute a food product, how can I let my customers know it meets the trans fat restrictions? All BC food service establishments with a permit to operate a food service must comply with the trans fat regulation. This may include restaurants, delis, hospitals, schools, bakeries, coffee shops and shelters. Documentation for food is kept on site and provided to the Environmental Health Officer upon request (ingredient lists, Nutrition Facts table or product specification sheet) for all food in your establishment. All food located on the premises of, used in preparation, served or offered for sale in a food service establishment. *Note: All food items includes all food products and ingredients used in food preparation (such as cooking and baking) and/or ready-made food that is prepared elsewhere and served or offered for sale at your food service establishment. Pre-packaged food with a Nutrition Facts table required under the Food and Drugs Act (Canada), sold or offered directly to the consumer without any alteration to the nutritional contents is exempt from the trans fat regulation. The regulation is in full effect. Environmental Health Officers or Food Safety Inspectors are enforcing the regulatory requirements as part of their routine food safety inspections. How is the BC trans fat regulation be enforced in chain food service establishments? Chain food service establishments are enforced as all other food service establishments, through routine food safety inspections. What documentation do I need to keep on site and provide to the Environmental Health Officer/Health Inspector to prove my food meets the restrictions? You must have an Ingredient List for all food items* on site, except for fresh fruits and vegetables, eggs, raw meat, fish or poultry. If a food item has one of the following words in the ingredient list: “hydrogenated," “partially hydrogenated," “margarine” or “shortening” you also need nutrition information that shows the amount of trans fat in grams (g) and total fat in grams(g) (ie. a Canadian Nutrition Facts table). The ingredient list and/or nutrition information can be on the food label, or a product specification sheet. This information can be available in hard copy or electronically. According to federal law, suppliers must have documentation available for all food provided to a food service establishment. Contact your supplier if you do not have this information. The Trans Fat Documentation Card (English Version) (PDF 611K) was developed to provide food service operators with clear information on documentation requirements. Translated versions are available. What about naturally occurring trans fat or “mixed” food items? The BC trans fat regulation does not restrict naturally occurring trans fat from ruminant meat such as beef, sheep, lamb, goat, bison and deer, or from dairy products, such as milk, cream and butter. Ready-made foods that have a source of naturally occurring trans fat AND a source of industrially produced trans fat (such as a meat pie or cream puffs) are called "mixed products" and must meet the 5% trans fat restriction. If I manufacture or distribute a food product, how can I let my consumers know that my product meets the restrictions? 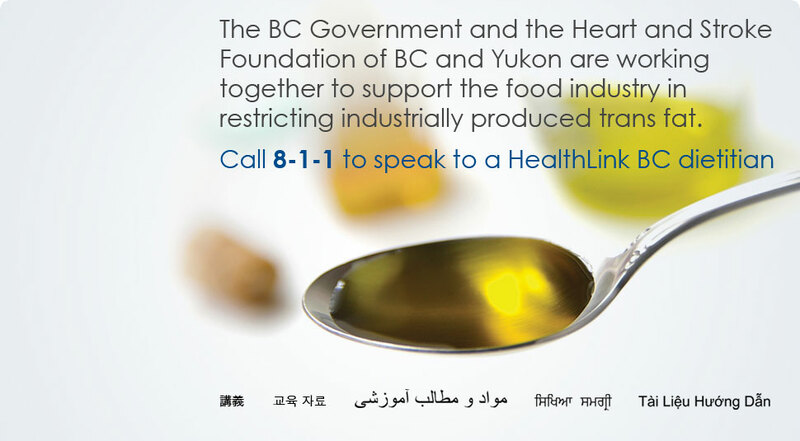 You can state "Meets BC's Trans Fat Restrictions" or "Meets the National Trans Fat Task Force Recommendations" on an invoice, order form or newsletter. Since all advertising claims about trans fat on food labels are regulated federally, you cannot make a claim about the trans fat restrictions directly on a product label.